Mark Ellingsen, Martin Luther’s Legacy: Reforming Reformation Theology for the 21st Century (New York: Palgrave Macmillan, 2017), 348 pp. The subject matter of this book is very dear to my heart. I have spent my academic and pastoral vocations in finding ways to make Luther relevant for our times. Mark Ellingsen’s focus in this book follows in the same path. I am grateful to Ellingsen’s scholarly and pastoral wisdom in reading Luther from a “pastoral-contextual paradigm” (5). In chapter 1 Ellingsen establishes why he prefers to read Luther from a “pastoral-contextual model” rather than reading Luther as a systematic theologian. As the author notes and I agree, to read Luther as a systematic theologian does not do justice to the richness of his thought and the paradoxical character of his theology. The author acknowledges that this is not a new insight, for he is aware how Paul Althaus, Gerhard Ebeling, Gerhard Heintze, and Jaroslav Pelikan, among others, read Luther operating within a “pastoral, contextual, conditioned manner” (3). But Ellingsen proposes to go beyond this insight. The author resolves to direct scholars to recognize the presence of a “pattern in the conceptual diversity of Luther’s thought” in addressing “similar pastoral concerns” (3). Luther throughout his career, Ellingsen observes, “articulated similar themes when addressing similar pastoral concerns.” “Identifying the precise nature of this pattern to his use of Christian concepts is rich in theological and pastoral implications,” for two main reasons. First, it provides us with “a fresh appreciation of the strengths of the various traditions of Luther interpretation.” It opens up, in other words, his thought to many heirs. Secondly, at the same time, it helps us “identify the pastoral purposes for which Luther deployed various doctrinal configurations” (3). The author hopes that we engage in a new paradigm for Luther research. This is that “we take lessons from the Reformer not just what contemporary Lutherans should proclaim, but also learn lessons from him on when to proclaim these insights.” This approach suggests also a new paradigm for systematic theologians to be sensitive to pastoral contexts (3). Ellingsen hopes that following this pastorally sensitive model in reading Luther not only will help us to overcome systematic distortions of the Christian faith, but also provide fresh insights into what the Reformation was all about, by being able to understand how the Reformer engages the richness of the biblical witness. This engagement, the author believes, is better able to “deal with everyday life in all its diverse situations” (10). Ellingsen then dedicates a chapter to the Reformer’s teaching on each of the major doctrines. He follows here the classical order of dogmatic topics (loci). He clarifies that following this order is not an imposition of a system or constructing a systematic theology. This point of departure is geared to order the material but not to determine the order of the analysis. The author, therefore, begins with the question of authority (Scripture), and proceeds then with God, His acts of Creation, Redemption, Sanctification, and all the things of the church. He warns that Luther would probably not have preferred this order if he had written a book organizing his thought on each of the doctrines. In fact, at times Luther ordered his theological expositions around justification or Christology. But when Luther sketches out the Christian faith in the Smalcald Articles and his Catechisms, Ellingsen points out, he follows an ordering of doctrines, and the order of these works very much resembles the order followed in this book. We now turn to a few examples on how Ellingsen applies Luther’s pastoral-contextual paradigm for today. The first example has to do with Luther’s understanding and proclamation of Scripture and his theological method (Chapter 2). Luther applies philosophical concepts and reason in his reading of Scripture; however, he articulates them under the logic of faith. 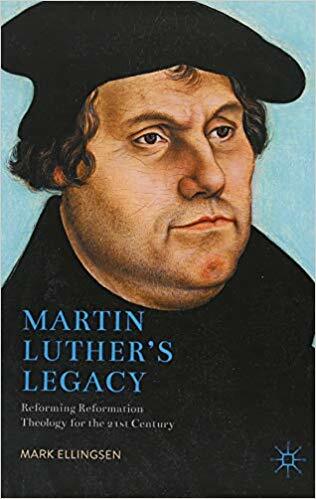 The author claims that Luther applies an “apostolic philosophy” which is “more eschatologically oriented, focusing not on the essence of what things are but on what they might become or how they relate to life” (19). I am in agreement with this, for I find in my study of Luther’s commentaries on the Minor Prophets this eschatologically-oriented proclamation of the Scriptures. Luther prefers, over the ancient Greek preference to focus on essence, instead to focus on existence and external relationships. While Luther applied reason in arguing for a natural knowledge of God, he found this knowledge imperfect and leading to idolatry. While Luther was a dialectical theologian in many ways, he proclaimed the gospel to reconcile the vicissitudes present in life in God’s grace and mercy (23). While Luther many times underscored a literal sense of Scripture and its clarity, his focus was Christological, proclaiming the unconditional presence of the love of God in Christ for this time and place to overcome the present evil and sin. Luther preferred to point out the knowledge of God by what God does and acts, adopting a Nominalist inclination to reality. He did this many times, Ellingsen argues, employing a narrative style of preaching the word, reminiscent of “Modern Narrative theology and the homiletics of African-American Church” (27). The Holy Spirit is ever present, Luther proclaims, touching our hearts and leading now with the vibrant Word of God present among us. I find this also very much to be the case in my own studies of Luther. It is not the only type of preaching or interpretation of Scripture applied by Luther. It is, however, a predominant one. Luther’s style, as Ellingsen pinpoints, leads us beyond deconstruction, skepticism, and fundamentalism to find how God is present with and for us today. Ellingsen writes: “Like modern Narrative Theology Luther teaches in preaching contexts that the Bible is true, even if not historically verifiable or if we discern some inconsistencies. The Reformer speaks of truth in theology in terms of God’s truth saturating our hearts (acting on us)” (27). Ellingsen accentuates here how Luther’s theology of the cross—that is, life under the experience of the cross—is central to the saturating of God’s truth and meaning in our proclamation and reception of the Scriptures (41–48). The second example is Luther’s teaching on Christology (Chapter 4). I was surprised how brief the length and discussion in this chapter are, since Ellingsen notes, and I agree, that Luther viewed Christology and the work of Christ as the heart of the Christian faith (97). The author, nevertheless, captures in this chapter the tender caring image of Christ and the theology of the cross in Luther’s theology. These themes he accentuates as crucial to Luther’s pastoral theology. Several important quotes are brought forth regarding how Christ takes care of us like a mother hen and a priest. These images are crucial in creating a pastoral contextual narrative for the proclamation of Christ for today. At the same time I find that the author dwells on many other themes in this short chapter that sidetrack his efforts from strengthening Luther’s pastoral contextual vision for today. I find, for example, the themes of Christ as our defender and servant priest anointed by the Spirit are strongly developed in Luther’s commentaries on Micah and Zachariah. These are, in my opinion, themes that truly resonate in our present context of a lack of mercy and an abundance of injustice in the world. We find a little treasure in Ellingsen’s discussion on how Luther understood and proclaimed the work of the Holy Spirit (Chapter 6). The author pinpoints important elements concerning the work of the Holy Spirit for our times. The Holy Spirit not only shows the way by instructing us but also kindles our lives with new hearts, love, and consolation. Ellingsen is very clear on how the articulation of faith in Christ needs to go hand in hand with the presence, passion, and emotion of the Spirit. The Holy Spirit in essence instills in us His consolation, and a passion and joy for service under the cross rather than a false pretense of perfection. This insight, I believe, is necessary in our pastoral practice for today. In fact, I believe that the growth of Lutheran Christianity in Africa today is due to a proclamation and pastoral presence where the Spirit lifts up our very lives with His presence, passion, and service for others in Christ. We are living human beings under the Spirit. We are more than communicators of theological equations. This is crucial for our pastoral paradigms for today, Luther understood this and Ellingsen captures this love, joy, and presence quite well in this chapter. It is crucial for our reading of Luther for today that we do not neglect his insights and teaching on the doctrine of justification. Ellingsen discusses this doctrine in Chapter 9. He argues, offering several citations from Luther, that it is the “principal doctrine of Christianity.” In the author’s own words: “The Reformer calls justification ‘master and prince, lord, leader, and judge of all teachings, which preserves and guides all churchly teaching and establishes our consciences before God.’ It creates true theologians. It is the criterion by which all matters of doctrine and life are to be judged” (167). Ellingsen gives priority in this chapter to the doctrine of justification as the Work of God, which destroys our false pretense and human efforts in order to serve him under the cross. He then offers a concise historical and dogmatic excursus on Luther’s teaching vis-à-vis scholasticism and Roman Catholicism, although he does not discuss these insights in light of the recent dialogue on justification between Roman Catholics and Lutherans. Again, he offers numerous valuable citations from Luther that explain the Reformer’s position. Among them he quotes Luther’s insights in Thesis 40 of his Disputation Against Scholastic Theology (LW 31:12): “We do not become righteous by doing what is righteous, but being made righteous we carry out righteous acts” (173). Ellingsen is very clear that Christians are called to live out, under the cross, the active righteousness of Christ. In other words, we are called to be active and not passive servants of God. The author offers also in this chapter a critical evaluation of the Finnish School of Luther studies initiated by Tuomo Mannermaa. The Finnish school gave priority to the living presence of Christ’s righteousness of Christ in a mystical manner over forensic justification (181–187). My personal preference would have been for Ellingsen to have engaged us more in what it meant for Luther to live concretely in the righteousness of Christ, the “blessed exchange.” He takes note of this theme very briefly in this chapter (172). The author discusses the theme again briefly in discerning God’s justice in society in Chapter 15 (312–314). In terms of contemporary pastoral paradigms it is very important to understand and execute what it means to live God’s justice trough trials and tribulations. A theology of Christ’s accompaniment of the faithful is crucial within the pastoral context of our times. This Christ with us and for us is very present under the “blessed exchange.” It is a theme that resonates in Luther’s Operationes in Psalmos of 1519 and in his commentaries on the Minor Prophets, especially Hosea and Micah. These offer numerous citations and observations on what the active righteous of Christ means in our lives for confronting the injustices carried out by the idolatrous powers of greed and gluttonous consumption. Christ lives with us in doing this work though our tribulations and trials under the cross. This is a very present theme in the theology of the martyred theologian Ignacion Ellacuria as well as of Jon Sobrino under the theme of the “crucified people.” We do not live as victims but rather as confessors and bearers of Christ’s presence and righteousness. Ellingsen understands very well, as explained by Luther, the power inherent in the doctrine of justification. The crucial need for our times is to destroy our false pretenses to be able to engage actively the mercy and justice of God for others. However, the need of the accompaniment of Christ needs to be emphasized. Ellingsen mentions it but spends more time contrasting the views of the Finnish School on the “mystical Christ” and the declaration of Christ’s justification. Ellingsen is to be congratulated and thanked for this contribution to Luther in light of a pastoral-contextual paradigm. This book offers clear and straightforward arguments that make Luther reachable to a wide audience. In addition, the research and endnotes throughout this scholarly study are also a welcome addition and a treasure to behold by scholars, pastors, and students of theology in understanding Luther’s theology. Alberto L. García is Adjunct Professor of Theology at Concordia Seminary–Saint Louis and Professor Emeritus of Theology at Concordia University–Wisconsin. He is co-author with John A. Nunes of Wittenberg Meets the World (Eerdmans, 2017) and editor and translator from Latin to Spanish of two volumes on Luther’s Commentaries on the Minor Prophets (Editorial Concordia, 2017, 2019).